During the Age of Revolution, Paris came alive with wildly popular virtuoso performances. Whether the performers were musicians or chefs, chess players or detectives, these virtuosos transformed their technical skills into dramatic spectacles, presenting the marvelous and the outré for spellbound audiences. 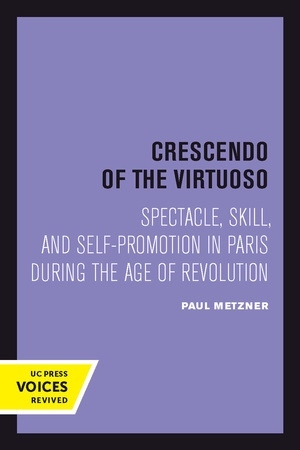 Who these characters were, how they attained their fame, and why Paris became the focal point of their activities is the subject of Paul Metzner's absorbing study. Covering the years 1775 to 1850, Metzner describes the careers of a handful of virtuosos: chess masters who played several games at once; a chef who sculpted hundreds of four-foot-tall architectural fantasies in sugar; the first police detective, whose memoirs inspired the invention of the detective story; a violinist who played whole pieces on a single string. He examines these virtuosos as a group in the context of the society that was then the capital of Western civilization. This title is part of UC Press's Voices Revived program, which commemorates University of California Press’s mission to seek out and cultivate the brightest minds and give them voice, reach, and impact. Drawing on a backlist dating to 1893, Voices Revived makes high-quality, peer-reviewed scholarship accessible once again using print-on-demand technology. This title was originally published in 1999. Paul Metzner is an independent scholar with a Ph.D. in History.